The majority of lunar images is now accessible in the image search. The ephemeris section is now also created dynamically – also low maintenance. A complete redesign might take a while but the upcoming Christmas season might be a good opportunity when nights are cloudy. 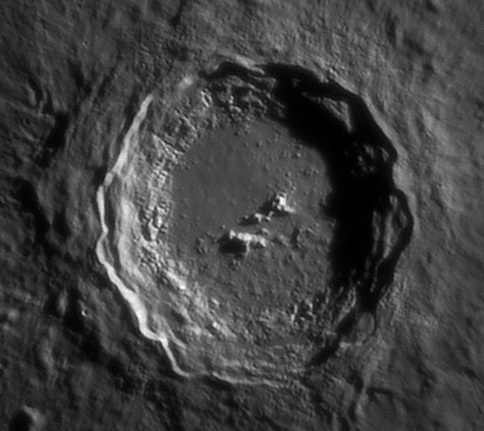 here’s another lunar image from April 23rd: Pitatus – one out of the ‘problematic’ footage. After fiddling with AS and Registax without much success I finally placed a number of alignment points in Registax5.1 manually, processed the AVI twice with different alignment regions and combined the best areas of both runs in PS. This footage seems to fool the automatic AP evaluation in AS and Registax. 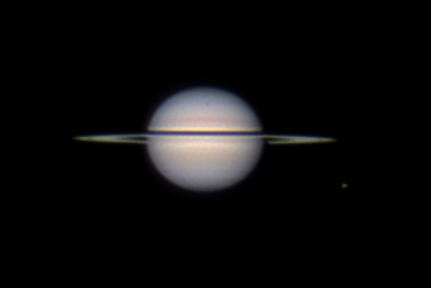 The results is not too shabby, resolution is on par with my Pitatus captured 2008 with the C9. 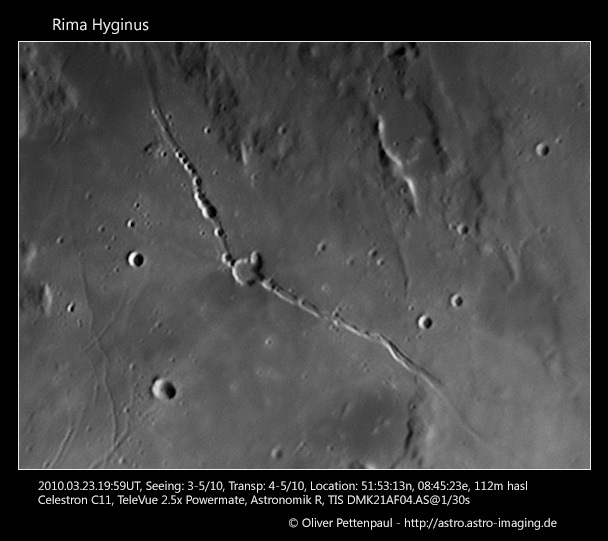 Pitatus is a fascinating crater with it’s lava flooded floor featuring many rills, cracks and craterlets that are a good indicator for the resolution achieved. 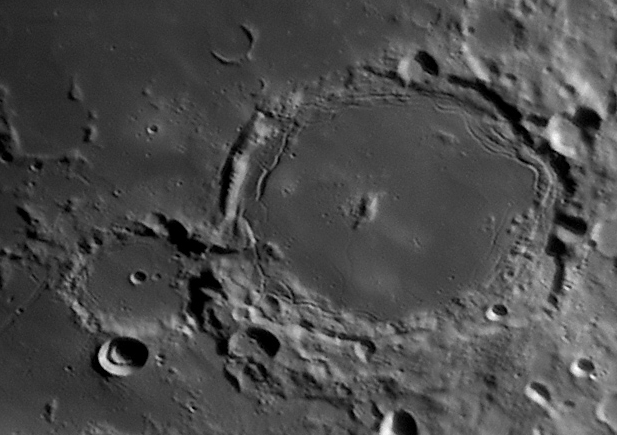 At least as fascinating is Hesiodus A, the CC (concentric crater) at the bottom left of the image. The reason for the concentric ring formation of CCs is unknown today, it’s safe to assume they are not formed by any kind of double impact. I fired up the already stowed away camera again and shot 4 AVIs: RGBR. Transparency was really bad that night so that I could only use 1/19s integration time for R and G and 1/11s for B. Capturing ~4000 frames at 7.5fps for the blue channel took forever. The AVIs have been processed in AutoStakkert and sharpened in Fitswork with the iterative Gauss sharpening. This gives the best results for my Saturn captures and enhances noise virtually not at all. Wavelets produce a lot of noise used on my Saturn captures and enhance cloud banding much less – quite in contrast to my lunar captures where wavelets work best by far. The RGB image is the result of the G,B,R imaging sequence. The result shows the Rhea-transit shadow and Titan. 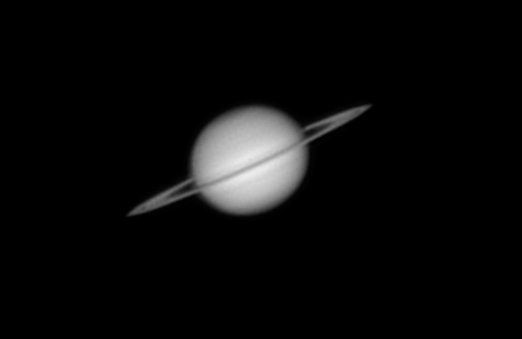 I aligned Titan on the R and B channel to it’s position in G and enhanced brightness/contrast partially. The cloud bands show some small details, most prominently above/below the rings and I’m not 100% confident these are real features. I created an contrast enhanced animation of both red captures but two frames aren’t enough to really tell all the features are real. finally some decent seeing. Skies have been clear on the evening of April 10th so I set up the already cooled C11 at dusk. Contrary to the forecast the seeing looked quite good this time during collimation of the scope and some quick glances at Mars. Just after I fired up the laptop and camera clouds rolled in and obscured the only 8.5″ measuring Mars. Waiting a while was rewarded by clear views again. The session was interrupted several times by clouds but later the skies stayed finally clear. I started to image Mars with a 2.5x Powermate delivering true f/25 with the C11 and tried the Meade #140 2x barlow later delivering a longer effective focal length (!) than the Powermate behind the motor-focusser and filterwheel since it’s not telecentric like the Powermate. Processing the first set of RGB captures shows that my estimation of the seeing was quite right, results are better than those of April 6th, no artefacts beside the diffraction artefacts at the bright limb. I slewed over to Saturn after imaging Mars but some preliminary results aren’t on par at all with the Mars material. Maybe seeing degraded (again), maybe the lower altitude of Saturn was quite critical this evening. The main benefit for the Mars captures compared to Saturn should have been the much shorter integration times freezing the seeing. The Mars AVIs show only a single very good frame surrounded by much more blurred ones from time to time. the night of April 6th looked promising, skies perfectly clear and the seeing forrecast was excellent. I set the C11 up at dusk, collimating the scope at a star showed only mediocre to fair seeing. 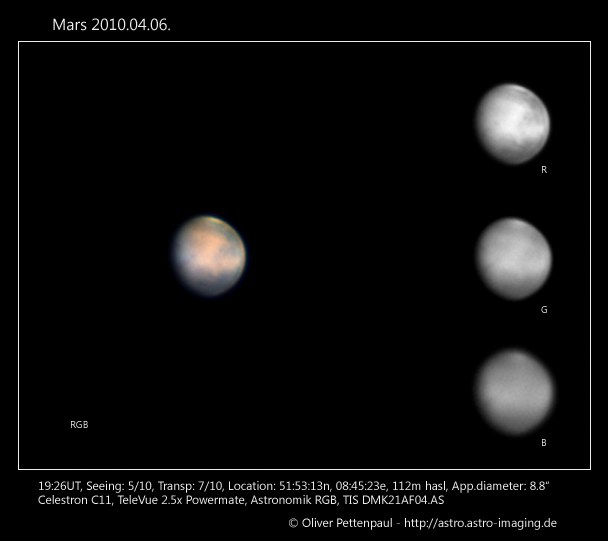 I started imaging the only 8.8″ measuring Mars after a short visual glance at Mercury and Venus low above the horizon. Seeing was quite unsteady, Mars jumped a lot with a high frequency but there seemed to be very short sharp moments inbetween. Seeing deteriorated constantly over the session – maybe due to the quickly falling temperatures – and quite strong winds arose later and blew the planet of the CCD quite often. 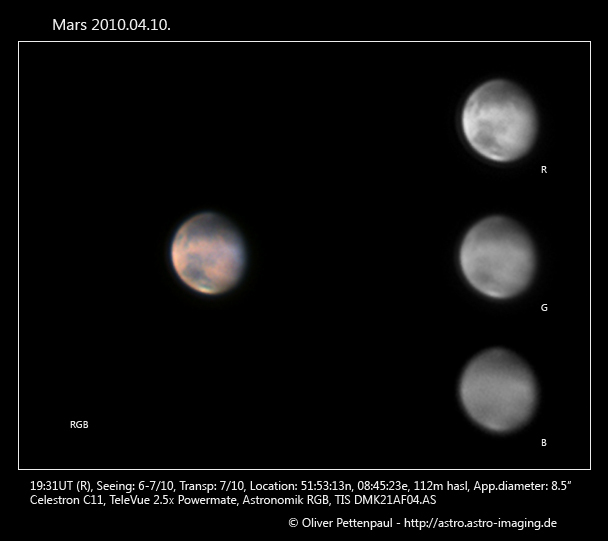 I was quite surprised when I processed the Mars AVIs of that night: Imaging with short integration times resulted in quite sharp frames in the AVIs packed between many blurred ones. Olympus Mons and the Tharsis Vulcanoes are visible in all channels, there’s nice dust over the Tharsis planes at the morning terminator.